Frittatas are cousins of omelets, hailing from Italy. 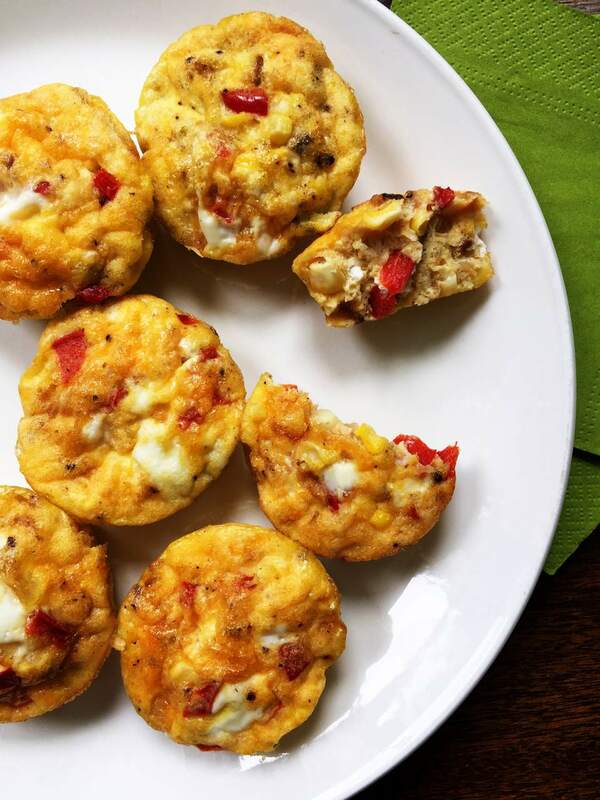 Usually they are made in one large pan, but they are so easy to make in muffin tins, and the result are mini-frittatas that are wonderfully portable, making them great to pack in a lunch. You can make them the night before and heat them for about 30 seconds in the microwave for an easy egg breakfast as well. These savory bites can be prettily served alongside other breakfast foods, or you can have them as a filling snack on-the-go. The seasonings used here are Greek, but you can mix in whatever herbs, vegetables, and other add-ins you have in the fridge. Frittatas are a great way to use up leftovers, from chopped greens to cooked rice to diced roasted meats. It's the same technique but the possibilities are endless. Let your kids get in on this, and see what they think might be a good addition to the next pan of frittatas. Grease a 12-cup muffin tin, or spray with nonstick cooking spray. In a medium skillet, heat 1 tablespoon of the butter over medium heat. Add the onion and red pepper, season with salt and pepper, and cook, stirring occasionally until the onions are golden brown and tender, about 6 minutes. Transfer the onions to a plate. Turn the heat to medium high, and melt the remaining tablespoon of butter in the same skillet and add the mushrooms, oregano, and thyme. Season with salt and pepper. Sauté for about 8 minutes, until the mushrooms are beginning to brown, then add them to the vegetables on the plate. Meanwhile, in a medium bowl, whisk the eggs, and add the onion and pepper mixture along with the mushrooms to the eggs and stir to combine. Use a large spoon to fill each muffin cup with the egg mixture, almost to the top. Sprinkle the cheese evenly on top of the frittatas and place the tin in the oven. Bake until the frittatas are set, the cheese is melted and the whole top is lightly golden, about 15 minutes. Remove from the oven and let sit for 2 minutes in the tin, then use a butter knife to remove the frittatas from the tin. Serve warm, at room temp or cold.